I first had shishito peppers at a Japanese restaurant on a trip to San Francisco a few years ago. Once I popped one into my mouth, I was blown away by how delicious and flavorful they were! 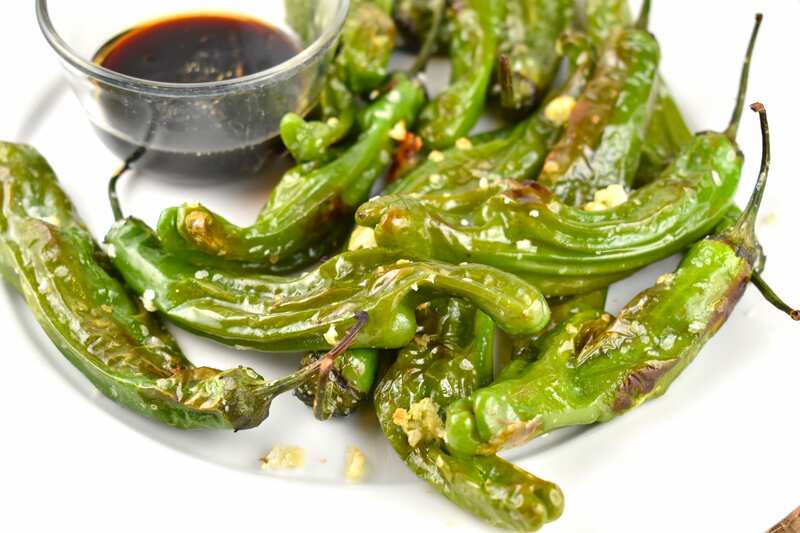 And that’s when my addiction started – every time I see shishito peppers on the menu now, I order them. The peppers themselves, are mild and sweet, with the occasional spicy one in the mix. But the ones I had at the restaurant were sauteed with garlic and served with an Asian-style dipping sauce. Let me just tell you that the aroma was heavenly! And the flavor combination of the sweet, smoky peppers with the salty sauce was truly mouthwatering. 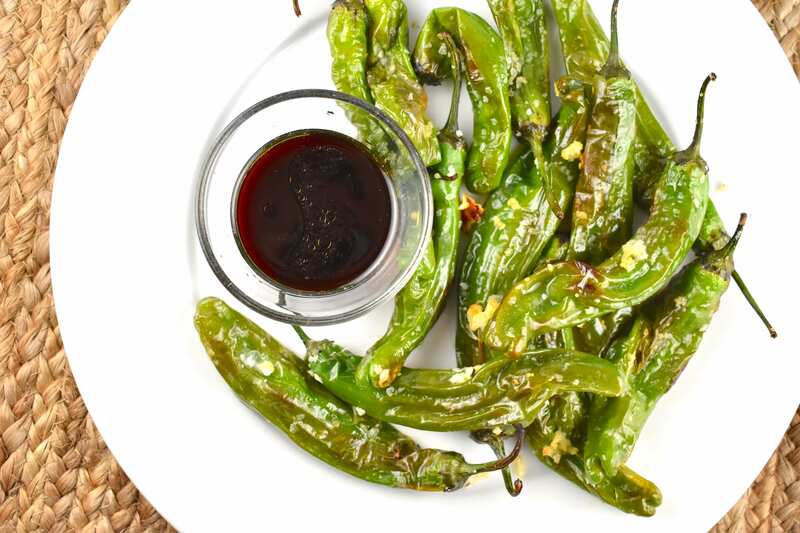 Once I had discovered the magic and deliciousness of shishito peppers, I began making them myself at home regularly. And my Roasted Shishito Peppers Recipe was born. They cook fast and easy, and the smoky, charred flavor that they get when they are cooked in incomparable. This is a very common question that I am frequently asked about when the subject of shishito peppers comes up. Yes! You absolutely can eat them raw. 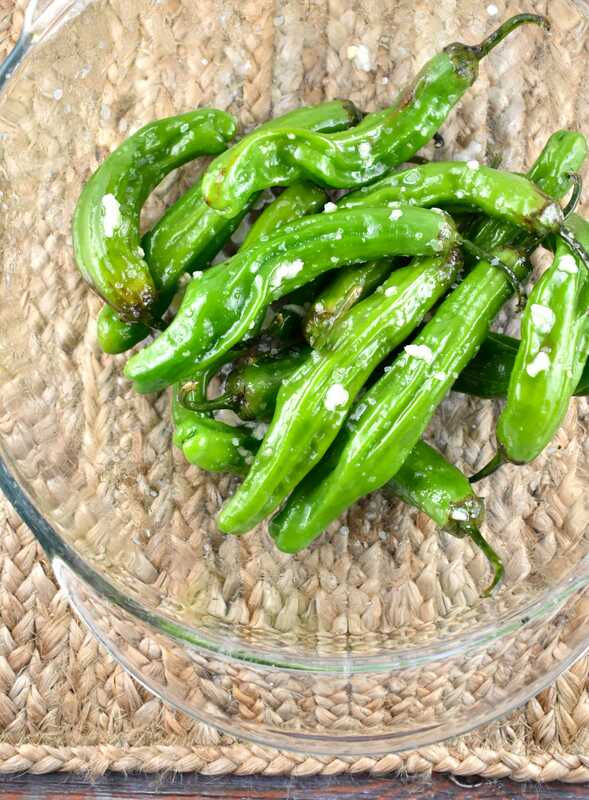 When you do, they have a slightly sweeter flavor, and the texture is crisper – kinda like a green pepper. While it’s ok to eat them raw, I much prefer the flavor and texture when they are cooked. There are essentially two cooking methods that most people use when it comes to shishito peppers – a cast iron skillet or oven roasting. To cook them in the skillet, simply heat a large cast iron skillet over high heat until the pan is nice and hot. Add a bit of high heat cooking oil, toss in the peppers, and cook the peppers, while tossing until they begin to blister. Oven roasting is my personal favorite method because it requires less babysitting for me, and I can avoid cleaning my cast iron pan (yep, sometimes I’m lazy like that). Once they are roasted, you just grab them by the stem, pop the whole pepper in your mouth, and bite it off at the stem. Easy and relish. I kept my recipe simple. Really, a basic roasted shishito pepper recipe is perfect – you don’t need to get fancy. But, if you really feel the need to kick things up a notch, you could always whip up some creamy dipping sauces like my homemade Chipotle Mayo or my Creamy Ranch Dressing. But truly, a nice roast and a sprinkle of salt are all they really need. One quick word of caution, while most shishito peppers are not spicy, every now and then you will get that has gone AWOL and will make your mouth feel like it’s on fire. If you like spicy – great! You’ll love that! If not…well, sorry about that. And don’t let the fear of the rogue spicy one keep you from giving them a try! Once you start eating them – it’s hard to stop! Like popcorn. I could seriously snack on them ALL DAY. Enjoy them as a healthy snack, tasty appetizer, or as a side dish to your favorite grilled meat. But don’t blame me if you become addicted too! LOOKING FOR MORE JAPANESE RECIPES? TRY THESE! 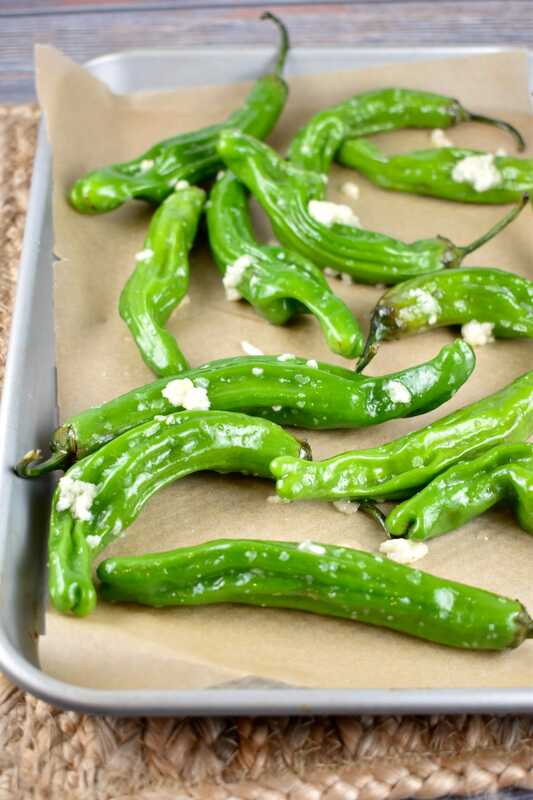 An easy, crowd-pleasing appetizer, these peppers are hard to stop at just one! 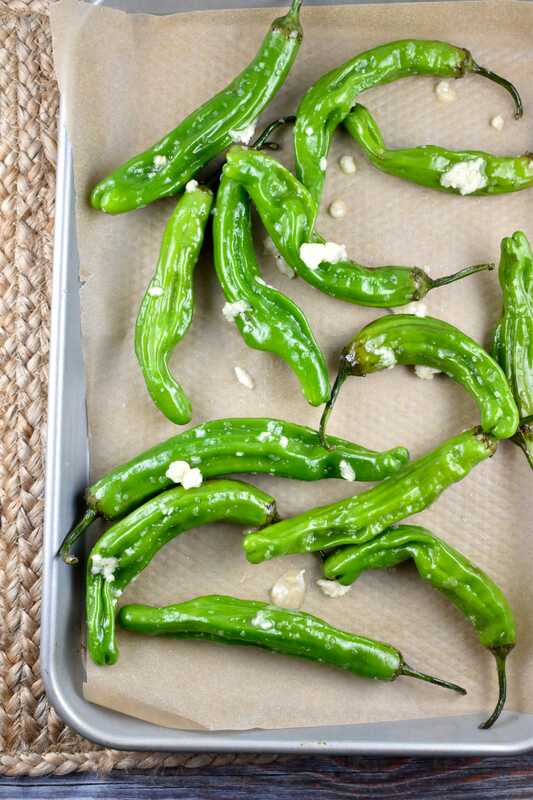 Salty, savory, and occasionally spicy, they also make a delicious and healthy snack recipe. In a large bowl, toss together the peppers, avocado oil, and garlic. Make sure all peppers are evenly coated. 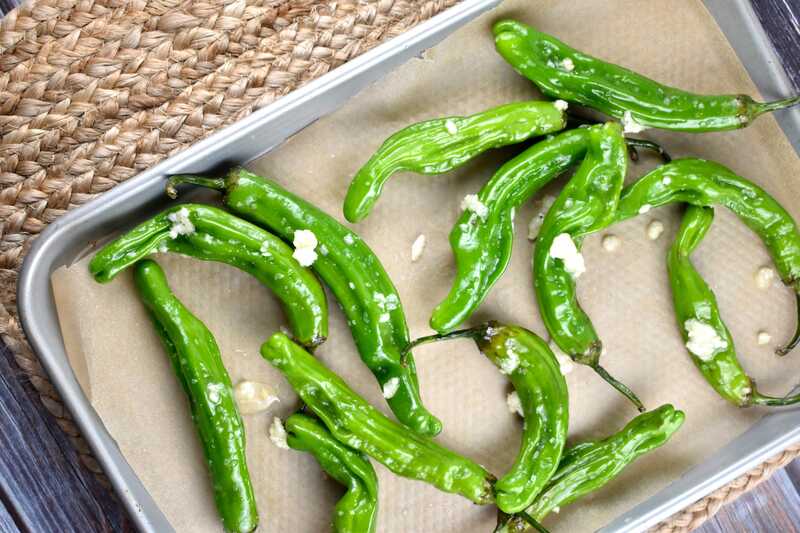 Place peppers on prepared baking sheet, sprinkle with salt, and roast in oven for about 8-10 minutes, or until peppers are blistered and puffed. Combine sesame oil, soy sauce and rice vinegar in a small bowl. Mix well. At what temperature do you roast these? Have you tried these in an air fryer? 450 degrees. I updated the recipe to indicate it. Thanks for catching that!